Hi loves! I hope you’re having a great start to September so far. Today I want to share with you a summer outfits recap of what I wore this summer. It won’t be a long one, because well, most of the summer I was asleep. As you may have already noticed, I was wearing a lot of oversized dresses since my pregnancy bump was showing from the very first weeks. If you wish to see more photos of an outfit, click on the photo to go on the specific post. 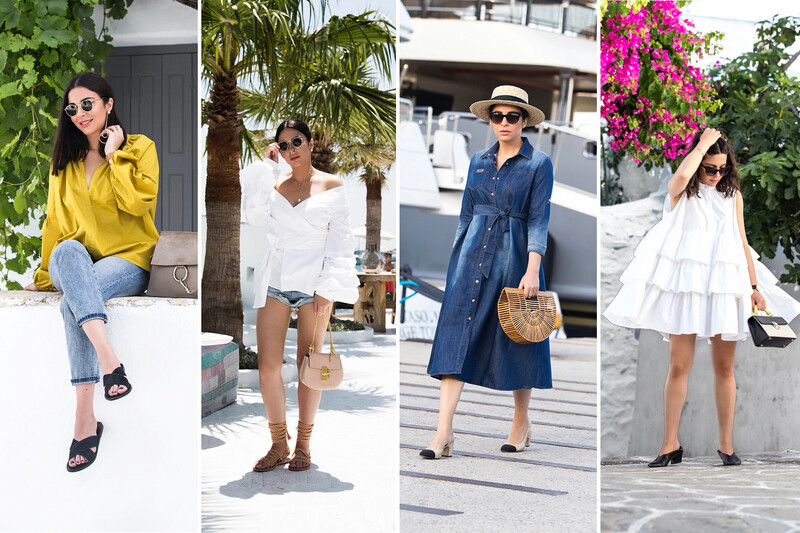 Please check them out and let me know which one was your favourite look from my summer outfits recap. 2. Still didn’t know that I’m pregnant, but I had an inexplicable glow for someone who woke up at 5 am that day. Back then, a friend told me “even your knees are glowing” haha! 3. My all time favourite little white dress from Zadig & Voltaire (as also worn here and here). 4. The first photo shoot after finding out. I was smiling so much that day, we could barely take some decent shots. 5. Let the oversized dresses begin. 6. Oh denim shorts. I am going to miss you so much! 7. The dress I wore for my private presentation at Versace during Haute Couture Fashion Week in Paris, last July. These Stuart Weitzman sandals are the most comfortable high heels ever. Yet, that day I couldn’t bare wearing them for more than 20 minutes. After these two days, I slept for a month, literally. 8. From the comments I received, this was your favourite oversized dress (and it’s back in stock). 9. Still hiding the bump with real mastery. The skirt zipper is almost fully undone. 11. A day at work, before clients’ embarkations at their yachts in Mykonos. 13. Boat trip to Tinos island. I hope you like my summer outfits recap! Which one of this outfits is your favourite? And what would you like to see on my fall outfits & posts? Please feel free to let me know and I will do my best to implement your ideas into my new maternity style. Fabulous recap ! I cannot pick a favourite, keep on shining my dear Stella. I love your style, you wore these summer outfits to perfection! Ps. I’m obsessed with this Chanel bag, the color is so beautiful! I love, too, the buttoned denim dress, and the tulle skirt is soo romantic and dreamy. In truth, Stella. you look stunning in all of them. Wow! All your outfits are amazing, I love them! #2, #3 and #5 are my personal faves! These oufits are sooo inspiring! Thanks so much for sharing this recap 🙂 Your pregnancy announcement picture is just so beautiful! <3 I hope everything is going great for you! In your Fall outfits I would love to see turtlenecks and wide-led pants 🙂 I am looking forward to discovering your next maternity outfits! I love this roundup! Your summer outfits have really been on point. And I must say that you are truly glowing in these photos. My fave pic is definitely the one from your pregnancy announcement :). So beautiful! love your style!! your summer looked so perfect!! Your Summer style is making me so excited for the Summer months to come here! Always so chic and utterly fabulous babe! As for your wonderful outfits showcased here, you always look so classy in each and every one of your photographs, my favourite is the third image along of you in the white dress and of course the last photo of you! These outfits are amazing. I love all the dresses especially the floral one! You look stunning in each outfit dear which made it so hard to pick a fave!! Congratulations on your pregnancy! I am so excited for you!! 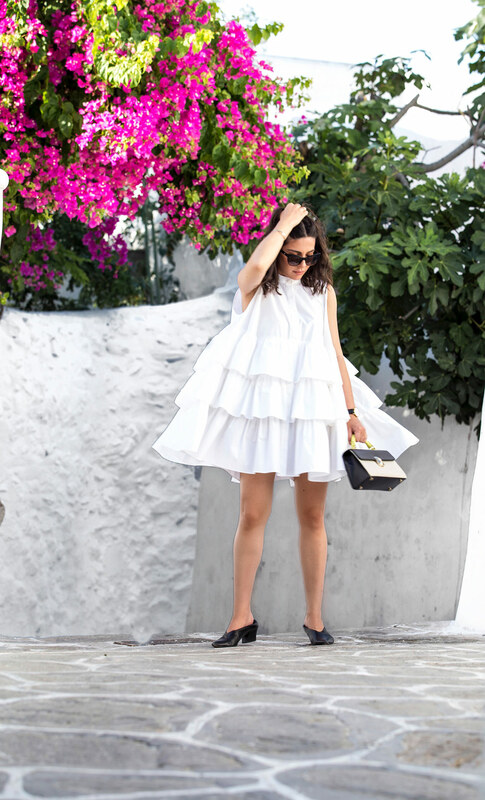 Your summer dress style is so fabulous! I especially love that first white oversized dress. Looking like one pretty mamma-to-be! So happy to have ended up on a re-cap post of yours. I always get extreme fashion inspiration from your posts so to see all these outfits collectively, it’s like I’m reading a magazine! I am not ready to say bye to summer just yet or summer dressing =P. I love the color of that yellow/ chartreuse top, looks so pretty on you! 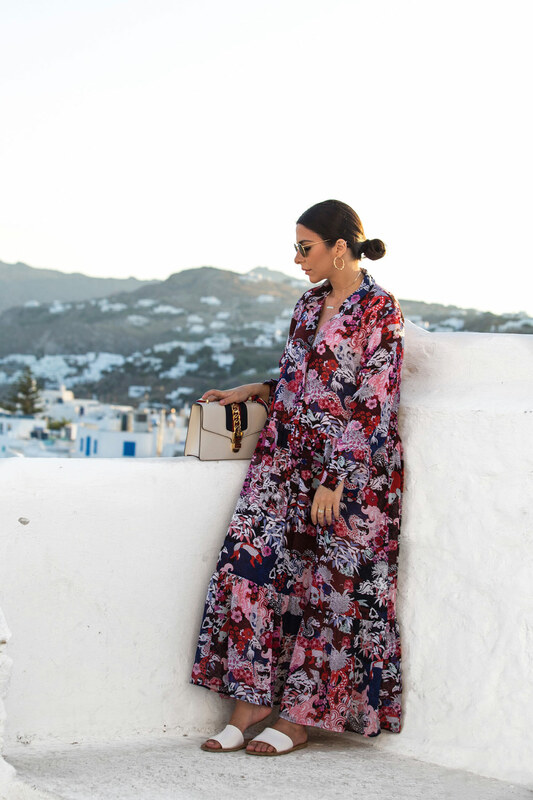 I plan to go to Mykonos next year and we should definitely get together! I love every single look! You have an incredible style girl! What pretty outfits, you look amazing in all of them! My most favourite ones were 2 and 3. What a great news about the pregnancy too! Stunning looks! The mustard top pairing is my fave.